A day after the New York metropolitan area was basking in 80 degree sunshine, late winter made another appearance tonight at Citi Field for a Mets – Minnesota Twins contest. It was only the first strange occurrence of the day. 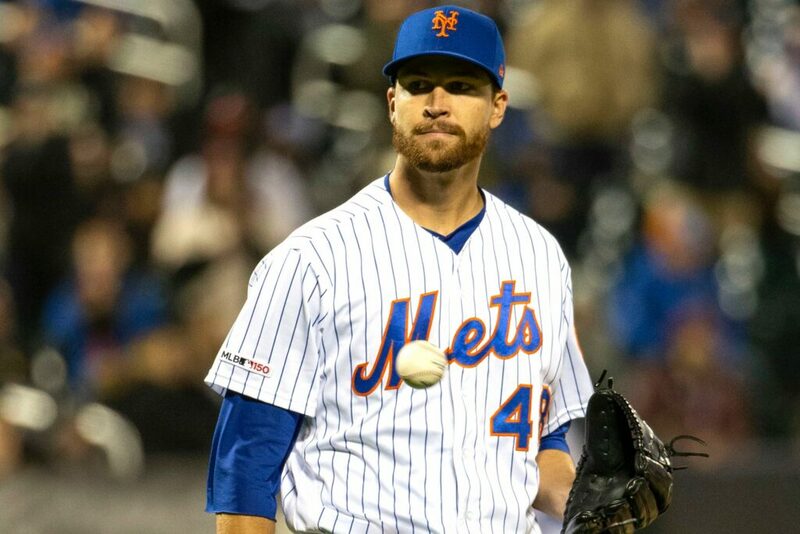 The other unlikely event took place when the Mets’ all-world, Cy Young Award winner, Jacob deGrom, took a beating from the Twins’ lineup of mostly no-names and underachievers at Citi Field, last night, with Minnesota winning the four-hour plus game, 14-8. It was the third start of the season by deGrom, who has turned into this generation’s version of Sandy Koufax. The Mets ace had pitched 31 consecutive starts allowing three runs or less, a major league record. Goodbye, record. It ended last night. In an off-night (the Mets hope), deGrom got wrapped around for six runs in four innings, including three home runs. That’s not just managerial hyperbole. Dominance became the standard over the last 19 months for deGrom, who followed up a subpar outing on Sept. 5, 2017 (he allowed nine runs, five earned, in 3 2/3 innings against the Phillies) by producing a 1.66 ERA and striking out 321 batters in 249 innings over his next 37 starts. Maybe the most shocking aspect of tonight’s outing by deGrom was how it was the light-hitting Twins, who came into Tuesday night with 35 runs, the eighth-fewest in the majors, and seven homers, tied for the fourth-fewest, was the team to administer such a beating. The Twins ended deGrom’s historic streak during a four-run third in which Eddie Rosario (who?) and Mitch Garver (who?) hit back-to-back homers. The Twins scored once more in the fourth, when deGrom at least avoided the indignity of getting pulled in the middle of an inning. Callaway visited him with two outs and left him in to try and get the final out, which was recorded when Travis d’Arnaud threw out Max Kepler trying to steal second base. On a cold night, the sparse crowd, announced as 22,126 but looking closer to 5,000, was either too cold or too shocked to get into the game. It was a quiet Citi Field as line drives and homers were flying off the Twins’ bats as quickly as the winds whipped off Jamaica Bay. “The whole time, I was still believing that I would be able to find it,” deGrom said. “Just didn’t happen. I don’t think I’ll ever be in a game where I’m out there and be like ‘I don’t have it.’ (Callaway) came out and said you’re at however many pitches, what do you want to do? I said I want to stay in there and continue to compete. I felt like I was going to be able to make some pitches, even at that point after giving up six runs. I still felt like I was going to be able to make a couple pitches when I needed to. Some pluses for the Mets to take from the game? Brandon Nimmo, in a season-long slump, led off the bottom of the third with a long home run off Twins starter, Kyle Gibson to make the score 5-2. Nimmo got two hits. Pete Alonzo, Robinson Cano, before Michael Conforto, off to a great start in 2019, walloped a Kyle Gibson fastballs for home runs with Conforto’s slamming into the facing of the Citi Field upper-deck in right field. It was Conforto’s third straight game with a home run, on top of his .385 batting average. Known for his slow starts, Conforto usually doesn’t warm up with the bat until June-July. And, Pete Alonso, the early favorite for Rookie of the Year honors and Hall of Fame candidate, hit two homers, the first multi-homer game of his career. But, it was too little, too late. And, like the shocking change in New York City weather from one day to the next, Mets fans had to accept, if not endure, the fact that their Sandy Koufax could have days like this, too.